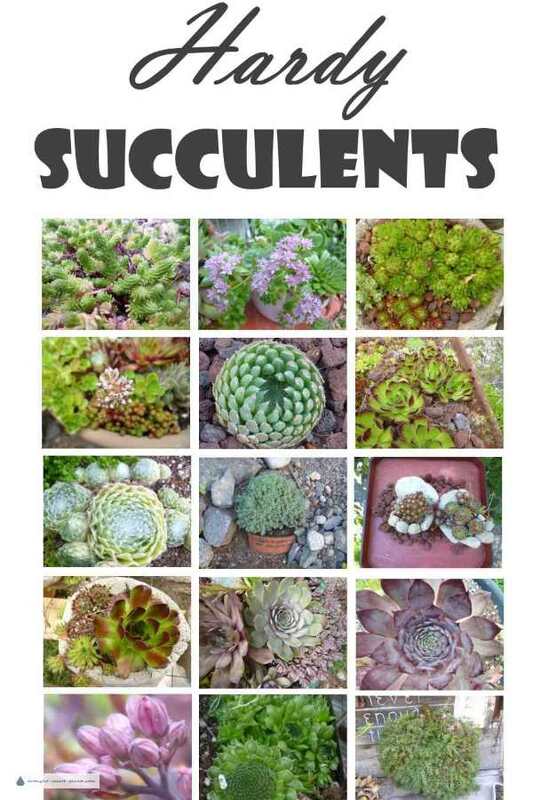 The term 'succulents' is used as a catch all phrase to mean 'plants that have succulent or fleshy leaves, stems or roots, and use drought smart strategies to survive'. Hardy succulents are those which originate in northern climates and do best with some cold winter weather for a dormant period. In my garden in Zone 5a in the interior of British Columbia, quite often I get lots of rain in the early summer, then a prolonged drought from July through September. After a good dowsing of rain in the fall, there is typically snow cover up to 60 cm (2') through the winter for a good dormant period. It's a surprise that the snow is so beneficial to Sempervivum, Jovibarba and Sedum, but when you think about it, many of them originate in high mountains, so the climate here is just what the horticulturist ordered. They sometimes struggle a bit through the heat of late summer, but start to perk up as the night temperatures drop. They come into their own in the fall, and are extra spectacular after a few nights of frost. Cooler nights bring out their colors and that special attribute, watermarks. Sandy well drained soil with the addition of a small amount of steer manure or compost, then the all important mulch of pebbles or lava rock are my most common garden preparations. Some of the most well known succulents are in our gardens right now, quietly going about their business of providing ground covering beauty and nectar for beneficial insects. Their deep root systems hold the soil in place, preventing erosion from rainfall or wind, and the flowers attract many butterflies and other pollinators. Rare hardy succulents such as Orostachys and Rosularia use their Crassulacean metabolic processes to survive extreme cold. They can survive incredibly cold winters with ease, and in many cases they can actually continue to grow right under a covering of snow. There are many hardy succulents which have been used on green roofs for many years, especially in Europe and Iceland. You may know these xeric plants as Sedum (stonecrop), Sempervivum (hens and chickens) or Jovibarba (rollers). Some of the toughest and most resilient plants on earth have adapted to cold, drought and terrible conditions. These are the ultimate of all drought smart plants, hardy cacti. Some succulents have perfected their camouflage with mimicry to avoid being eaten by thirsty creatures. Many alpine plants native to high mountain tops are succulents. Succulents are addictive - consider yourself warned! It's important to recognize the difference between tender and hardy succulents; tender ones are not frost hardy, and must be overwintered inside; hardy ones need a cold dormant period, and are prone to aphid infestations or other problems in the warm conditions of your house. The new popularity of all types of succulents, both hardy and tender kinds has resulted in some amazing new plants being introduced, or re-introduced, and a wide range of interesting uses for them. Succulent wedding flowers, succulent wedding bouquets and succulent wedding favors are some of the most beautiful creations for that special day. 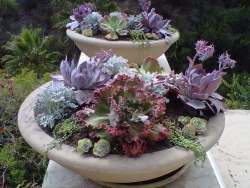 Easy to construct and long lasting, these succulent crafts have the added bonus of planting them as an eternal memento. See the Succulent Wedding Gallery for more ideas and inspiration. Combining these amazingly tough and drought tolerant plants in containers for succulents, collections of terracotta clay pots, a strawberry pot, tin cans for succulents and many other imaginative creations can be an addicting experience. Hypertufa is one of the fastest growing hobbies, particularly attracting succulent growers and alpine plant aficionados. 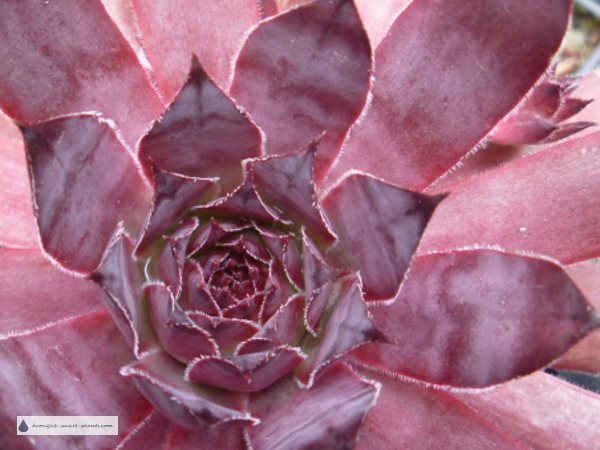 The many uses of the amazing variety of succulents will amaze and delight you. 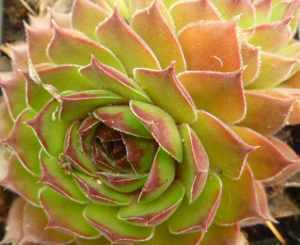 A Sempervivum wall, a succulent topiary or Sedum tapestry will give your garden a low maintenance and beautiful focal point. Autumn is the best time to put your Semps to bed. I usually remake at least a few of them, in flats where they'll root over the fall and winter, giving me a lot of options to choose from in the spring. Don't leave them in planters that will hold water, or in places where water will collect - this will most likely kill them.